By Sam Smith | 11.19.2015 | 9:00 a.m.
Jimmy Butler didn’t drive the team bus to the arena Wednesday in Phoenix. He didn’t tape anyone’s ankle. He didn’t sing the national anthem. But Butler did pretty much everything else for the Bulls in a spectacular down-the-stretch shooting and defensive performance to carry the Bulls to a 103-97 victory over the Phoenix Suns. It was an unlikely and perhaps unexpected start to the Western Conference road trip with Derrick Rose out with an ankle injury, Aaron Brooks going out with a hamstring strain and the high flying Suns with the fastest pace of play in the NBA coming in with three straight wins. And running to a 23-7 fast break margin in the game. But Butler’s 32 points, including 14 in the fourth quarter as Butler played 43 minutes and scored nine points in the last 2:46, enabled the Bulls to come back from a deficit with 4:47 left after blowing a 17-point lead. It was a bravura triumph for Butler and the 8-3 Bulls with their fourth straight win. “He was phenomenal,” gushed Bulls coach Fred Hoiberg about Butler. “He just took the game over. Offense, defense. He was guarding the best player (Brandon Knight with 23 points). I tried to take him out; he wouldn’t let me. He did it all for us in that fourth. It was great stuff from the Bulls in what seemed like the unlikeliest of circumstances given the injuries and the environment. The game got physical with Suns rookie Devin Booker challenging and taking a hard shot at Butler early in the fourth quarter, which seemed to also get Butler on edge. Like Butler did. An emotional Butler with the Bulls ahead 76-73 early in the fourth immediately went back at Booker for a three-point play and then brought darkness down on the Suns. 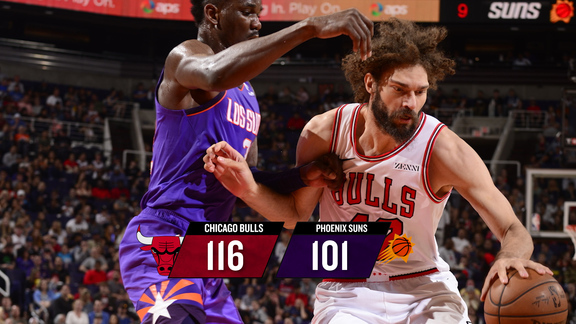 Pau Gasol added 17 points and eight rebounds and absorbed his own hard foul, responding with a drive from the free throw line and power dunk after the Suns went ahead 89-88 with 4:47 left. Brooks sustained his second hamstring strain at that point and left for the rest of the game. But Kirk Hinrich in his best game of the season with 14 points and six assists, his first double digit scoring game since last January, had to come back into the game after apparently running out his time limit midway through the third quarter. Hinrich didn’t hesitate and stepped right into a three for a 92-88 Bulls lead with 4:03 left. And then the Bulls held the Suns without a field goal for almost four minutes down to 1:28 left. Eric Bledsoe with 21 points finished a drive to get the Suns within four. But Butler followed that with a three with the shot clock down to four seconds for a 99-92 lead with just over a minute left to effectively clinch the victory. “They are just a great team and beat us on the defensive end,” said Bledsoe. Butler added a slam dunk on a Hinrich pass with nine seconds left as a gift to the crowd that often sounded mostly for the Bulls in snowbird Phoenix. Enjoying his scoring role with four games of at least 26 points in the last seven? Butler was asked. “A lot,” he conceded. “It just shows how far I’ve come and how I worked on my game to be able to score the ball late and for my teammates to know my ability to score the ball. That’s the utmost respect coming from them to me and me returning the favor because I’m showing I can put the ball in the basket. Suns coach Jeff Hornacek was impressed as well. It simply was a marvelous evening for the Bulls in the ESPN national TV game. Brooks has 12 points, but his status seems doubtful for Friday in Golden State against the undefeated Warriors. Joakim Noah had 11 rebounds but was scoreless while Nikola Mirotic got off to a fast start when the Bulls took a 17-point lead midway through the second quarter. But he and fellow starter Tony Snell, the latter scoreless in 19 minutes, struggled after that good start and both didn’t play in the fourth quarter. Doug McDermott finally got significant fourth quarter playing time and hit three of four shots in the fourth. Hoiberg also went the entire fourth with Taj Gibson for his defense. The Suns came in averaging 105.8 points per game, third in the NBA, and shooting 45 percent. But they could manage even at home just 40.7 percent shooting and 97 points. For a Bulls team often maligned this season for its defense, it was an impressive effort. It was encouraging because the Bulls with talent often seem to be punching the clock in a basketball sense. But Wednesday’s commitment was hardly routine as despite being without Rose, the Bulls thundered out to a 31-18 first quarter lead with 10 from Butler and eight from Gasol. The Bulls made 10 of their first 13 shots. But in many respects Hinrich was the engine as he got the Bulls pushing the ball faster and with more half court movement that enabled Mirotic to get back on track with a pair of threes. The momentum continued into the second quarter with Brooks coming in after not playing the last game and giving the Bulls an offensive boost with a three and fancy driving bank shot. But Mirotic got shot happy, firing off several wild, running bank shots that enabled the Suns to get out running for a 15-4 run. The Suns then pulled within 53-47 at halftime and Snell and Mirotic both played just eight second half minutes. The Suns got control of everyone but Butler and Hinrich in the third quarter to get within 72-70 after three. Still, it looked like the kind of game a visiting Eastern team would give away as the Suns took their first lead since 5-4 when Booker’s long three gave them a 73-72 lead and the “Let’s go Bulls” cheers were being drowned out for a bit. Hoiberg said he wanted to give Butler a rest to start the fourth. McDermott answered with a floater on an offensive rebound. Butler then drew free throws from the frustrated Booker and the three-point play. McDermott finished a nice curl for a layup off a weave and added a reverse layup in which he gave it a collegiate yell. And then it was Gasol with his emphatic slam and Butler with his excellent finish. And now on the way to play the league’s best team who hasn’t lost at home in the regular season since the Bulls beat them last January. “We can’t stick on this one too long because the team we got next is real,” said Butler without dismissing the Suns. But they’re already talking 73 wins about the 12-0 Warriors. “Their record speaks for itself,” said Butler, who said he’ll remind Hoiberg he wants to defend Stephen Curry.